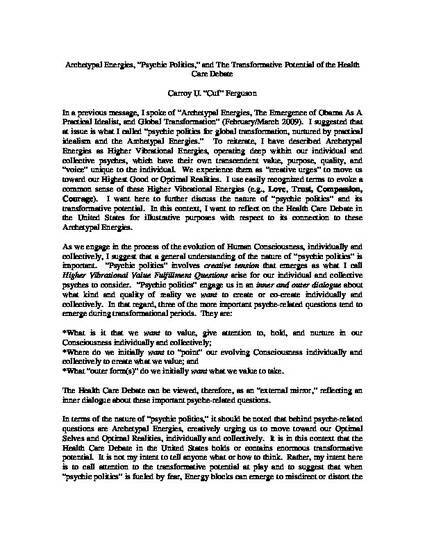 In a previous message, I spoke of “Archetypal Energies, The Emergence of Obama As A Practical Idealist, and Global Transformation” (February/March 2009). I suggested that at issue is what I called “psychic politics for global transformation, nurtured by practical idealism and the Archetypal Energies.” To reiterate, I have described Archetypal Energies as Higher Vibrational Energies, operating deep within our individual and collective psyches, which have their own transcendent value, purpose, quality, and “voice” unique to the individual. We experience them as “creative urges” to move us toward our Highest Good or Optimal Realities. I use easily recognized terms to evoke a common sense of these Higher Vibrational Energies (e.g., Love, Trust, Compassion, Courage). I want here to further discuss the nature of “psychic politics” and its transformative potential. In this context, I want to reflect on the Health Care Debate in the United States for illustrative purposes with respect to its connection to these Archetypal Energies.